Gemini Arabians continued their winning start to the MCL as they won their third game on the bounce, beating the Capricorn Commanders by 10 runs in a last-over thriller. Thanks to fifties from Virender Sehwag and Kumar Sangakkara, Arabians posted 190/4, which proved to be too many for Paul Collingwood’s side. After winning the toss, Sehwag had no hesitation in batting first and he got his side off to a flyer in the very first over. Perhaps wanting to make up for the fact that he ran his opening partner Richard Levi out, Sehwag went on to compile the fastest fifty in this year’s tournament. His half-century, which came off just 24 balls included six fours and three sixes, the third of which, got him to his fifty. 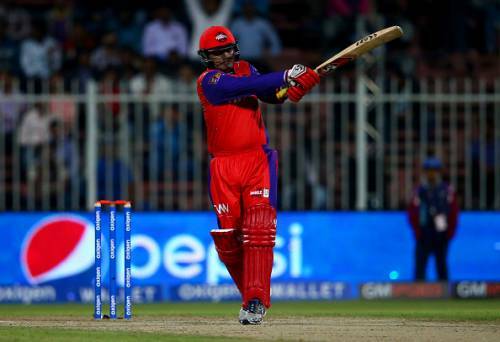 But after looking set for a century, Sehwag fell to Abdul Razzaq, in his first over of the match. Despite the loss of Sehwag, the Arabians continued to tick along at a fair rate thanks to the former Sri Lankan batsman Kumar Sangakkara. The southpaw, who had hit a fifty and an unbeaten 41 in his first two matches, continued from where he left off. After a slow start to his partnership with Brad Hodge, Sangakkara started smoking the ball to all corners of the pitch. Although his fifty was 10 balls slower than Sehwag’s, he brought it up with a six, just like the former Indian opener. But he too departed for 65 and it needed a few lusty blows from Justin Kemp to get the score to 190. In reply, Commanders got off to the perfect start as both Ashwell Prince and Andrew Symonds started striking the ball sweetly and had helped their side race to 50 off just 25 balls. Symonds, who had hit two sixes and three fours in his innings, perished on 30 to Kyle Mills in the final over of the powerplay, with the score already at 65. With Prince set and Rizwan Cheema, who hit a massive six, looking dangerous, Commanders looked as though they might cruise to victory, despite the massive target. But the game turned on its head in the 10th over, when Sehwag brought on part-time spinner Jacques Rudolph, who got the wicket of Cheema just before the strategic time-out. And in the following over, Prince followed him back as the Commanders were suddenly left with two new batsmen. Although captain Paul Collingwood was dismissed for 9 with the run rate creeping ever higher, they still had hope as long as Razzaq was at the crease. But that hope only lasted until the first ball of the 18th over as the former Pakistan all-rounder was dismissed by the returning Mills for 32. From there onwards, Commanders lost a few wickets in succession and although the final margin of victory was just 10 runs, it was in fact, more comprehensive than that. IPL 2019: What is hurting KKR so badly that they have lost six matches in a row?